What Is The Best RV Water Pressure Regulator? Water is essential to life! Installing a quality water filter to your RV’s water system can give you the clean, fresh and sweet-tasting water that’s vital for your family’s health. It can save you lots of dollars from not having to buy bottled water while you’re moving from campground to campground. 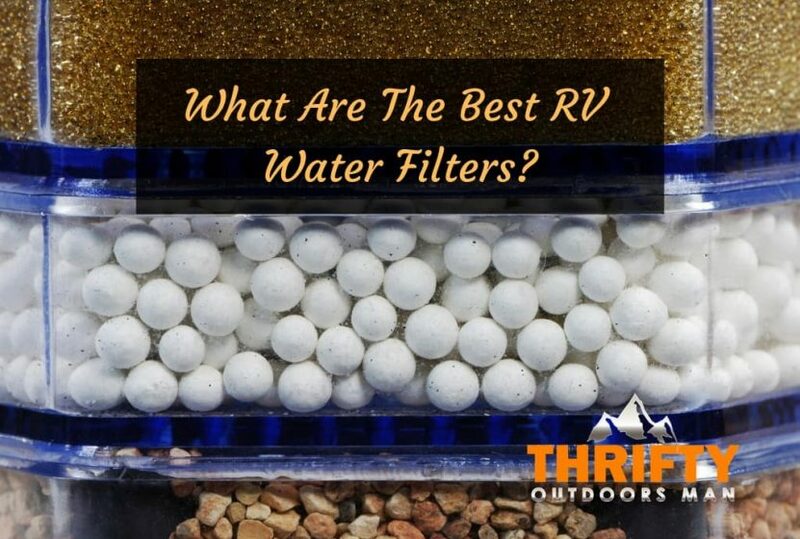 How Do You Choose a RV Water Filter For Your Needs? Depending on your area or the area of your chosen campground, you’ll face various levels of water issues. Some areas have average problems and a simple water filter will cover your basic need for purified water. Other areas are not so blessed! Water with a foul smell and taste can come from a heavy metal overload, high levels of chlorine or sulfur content, or even poisonous contaminants. To view the long-term effects of chlorine, see video below. For locations with highly contaminated water, you’ll want to consider filters that greatly reduce or even eliminate the impurities. Carbon or GAC filters with KDF treatments are excellent choices for bad-tasting and foul-smelling water. For areas with high sediment levels, you may need to consider getting a dual grade filter cartridge. What Exactly Is a GAC (Granular Activated Carbon) Filter? Charcoal, which is a form of carbon, resembles a cross between graphite and a sponge. See below video for a visual definition of activated carbon. Its porous body is prime ground for luring and trapping contaminants like chlorine, pesticides and other poisonous solvents residing in your water source. A GAC filter has the ability to greatly reduce these contaminants from your water line. Much like a sponge, this filter absorbs the impurities until it gets saturated to the point that it actually clogs and needs replacement. Note with setting up a granular activated carbon filter, it’s advised to run the water through the filter until the excess carbon particles are washed out. Once the water runs clear, the filter is ready for use. What’s the KDF (Kinetic Degradation Fluxion) Process Media? The KDF55 is an ingenious design that utilizes science to bring healthy drinking water out of your kitchen tap. This process does just that! The alloys copper and zinc use their positive and negative charges to work together in attracting metals such as aluminum, mercury, cadmium, lead and arsenic. These metals bond with the copper and zinc to form a plate, effectively removing these metals from the water. Some contaminants react by changing form and pass through the filter as harmless substances. Free chlorine is one such impurity; it changes into water-soluble chloride salt. In this reaction process, copper and zinc chelates multiply in a controlled amount. They enter the water system as nutrients that are actually beneficial to the human body. This whole process creates an uncomfortable environment for bacteria, viruses, and mold. The KDF process is commonly used with GAC filters to enhance the performance of the carbon and reduce the bacteria growth while the filter is not in use. When Do You Change the Cartridges In the Water Filter? Most water filters are advertised to last through one camping season. More advanced water filters can last much longer than that. Cartridges still need to be maintained regularly. Typically, full-time RVers will change their cartridges quarterly, or every 3 months. High levels of contamination and sediment will greatly reduce the life of the cartridge in your water filter. It’s always an excellent idea to keep a close eye on your cartridge. Remember that water expands when it freezes. In order to protect your water filter, store it safely in a warm place during freezing temperatures to prevent the housing from cracking. Secondly, water filters are designed to make potable water healthier and more pleasant to drink. They’re not designed to make non-potable water, potable. Made in the USA, this 20 micron sediment filter uses GAC and KDF technology to greatly reduce chlorine taste and smell, sediments, bacteria, and other contaminants and odors to make your potable water healthier. It removes aluminum, cadmium, hydrogen sulfide, iron, lead, and mercury from the water which makes this a necessity for RVs, boats, campers, pets, and gardening. Featuring a wide body that lines up with the hose, this filter is able to produce a high flow rate. The filter is compatible with any standard water hose. The included Flexible Hose Protector keeps the water hose from crimping and straining. In between uses, consider airing out the filter to prevent any water left inside from turning stagnant. The RVF-10 model is designed with sturdy, slim housing and a GAC cartridge filtering system that gives you water that tastes better and a storage tank that stays cleaner. By eliminating foul taste and odor, chlorine, and sediment, this water filter is ideal for RVs. It lasts up to 250 gallons or 3 months. This filter comes with a hose connection kit and a spare model D-15 replacement cartridge. This impressive, top quality Premium RV Water Filter System sends water through 2 5.0 micron filters. The sediment filter and the carbon block filter work together to eliminate chlorine, cysts, giardia, volatile organic compounds, and other impurities. Both filters are protected by 2 large filter canisters. Although this is a dual filtering system, this water filter produces a high flow rate. The system features stainless steel fittings and a powder-coated metal chassis which makes it easy to set up and keep standing. This water filter uses KDF and GAC technology to reduce sediment, bad tastes and odors caused by chlorine, aluminum, cadmium, heavy metals, hydrogen sulfide, iron, lead, and mercury; and controls bacteria levels. Its 5 micron barrier results in fresh, clean, and great-tasting drinking water for one camping season. The filter’s compatibility with any standard garden hose connection makes it easy to install. Included in this filter system is filter housing, one extension hose, one replaceable filter cartridge, a cartridge wrench, and teflon tape which can be applied to fittings to eliminate any potential leaks. Using the KDF process along with the GAC filter, the Culligan RV-800 water filter reduces bacteria, bad taste and odor, chlorine taste and odor, sediment, other contaminants, and turbidity. The standard hose fittings and the included 12-inch connection hose make it easy to connect to your RV, motor home, trailer, or boat. The RV-800 model has a high flow rate that can last up to 2,000 gallons which makes this a great choice for larger families or higher water demand. For storage, it’s strongly advised to cover the filter with ends to keep the filter wet and contained. Which Filter Do You Prefer? If you don’t mind changing the entire filter every camping season, you may want to consider the Camco TastePURE Water Filter which does an excellent job of removing metallic and chlorinated tastes and odors from the water. If you don’t use extensive amounts of water and prefer to change only the cartridge instead of the whole filter, you may want to go with the Culligan RVF-10 Exterior RV Drinking Water Filter. The Clearsource Premium RV Water Filter System may be what you’re looking for if you’re dealing with highly contaminated water and can afford a higher quality investment. The dual filtration system has a nifty built-in stand and produces clean, healthy and safe drinking water. If the pressure regulator doesn't come with a hose, you can buy one fairly cheap from our list of the best RV Water Hoses. Providing clean drinking water for your family is vital! Choose a filter that meets your specific water needs. Also, check out our posts on the Best RV tankless water heaters and Best RV Water Pump. What Is a Tent Vestibule? Hey there, I'm Tom, founder and editor in chief here at Thrifty Outdoors Man. I love spending my time outdoors with my wife and our two kids. I'm on a mission to share my adventures experience with all of you. Shane on Pepper Spray vs Bear Spray: What is the Difference? Ray on Pepper Spray vs Bear Spray: What is the Difference?